Soup can be an elegant, light appetizer to whet your appetite or it can be a substantial meal that satisfies your hunger. Germans are great soup makers and find many ways to serve hot, steaming bowls of homemade winter soup. Vegetables, meat broths, sliced cold meats, sausages, creamy cheese — even sauerkraut and fruits — can all form the basis of a good German soup. And you’ll find a wonderful variety of German accompaniments for soup — such as dumplings, pancakes shreds, noodles, croutons and toast. Sauerkraut lends itself to a winter warming soup. This is more of a main meal soup to which you can add slices of your favorite smoked German sausage. Chunks of rye bread are a good accompaniment. Don’t keep salami just for salads and snacks. Try adding it to hot dishes such as soups. In this recipe, the full smoky flavor is nicely balanced by the creamy sweetness of pumpkin. Pumpernickel makes delicious little toasted croutons which can be spread with green-herb-flavored quark (available from specialty stores and online) to float on top of soup or served alongside. A light creamed vegetable soup such as zucchini, carrot or mushroom would be a good base to serve them with. The spinach leaves give this soup a fresh green color. 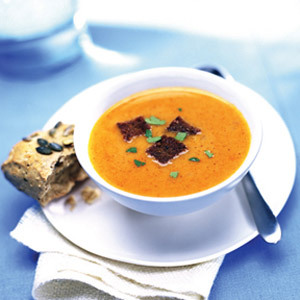 German cheeses and beer combine with touches of chili and whole grain in a tasty soup with a warming color and flavor. This is a truly nourishing soup – high in protein, fiber and flavor. It’s also very versatile because not only can you serve it as an appetizer, it also makes a wholesome light meal with a chunk of German rye, linseed or sunflower seed bread. It’s a perfect back to school choice for busy mums! Make it with green spilt peas and chopped fried bacon. You can use either beef, chicken or vegetable broth for this recipe, or use the cooking liquid from boiling a ham. Make sure to use genuine German Frankfurters such as the Meica brand. It is quite thick, so if you prefer it thinner, simply add extra water. This soup is adapted from Chef Ludger Szmania at SZMANIA?S in Seattle, and is in honor of his mother Mathilde Szmania.